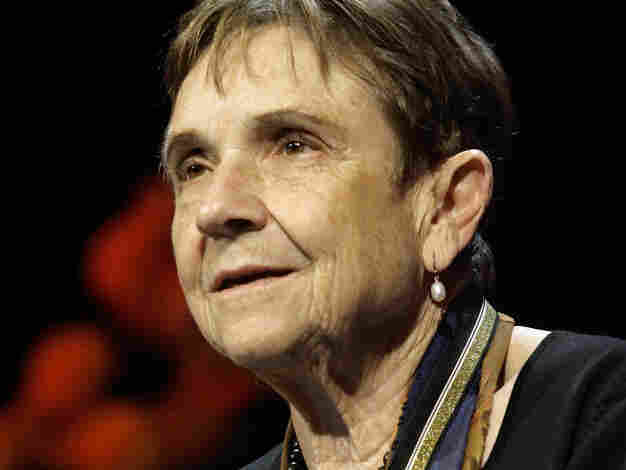 Adrienne Rich On The Powerful, Powerless Mother Adrienne Rich, one of the first widely published contemporary feminist poets, died Tuesday at her home in Santa Cruz, Calif. She was 82. Fresh Air remembers Rich with excerpts from a 1989 interview. Poet Adrienne Rich received several notable awards over the course of her career, including a MacArthur Fellowship, the National Book Foundation Medal for Distinguished Contribution to American Letters and the Frost Medal. A young female poet was speaking to a male poet at a party. "Women shouldn't write poems," he told her. "They are poems." The young poet was a friend of Adrienne Rich, who used that story as an example of what female poets were up against in the 1950s and '60s, when she was first becoming established. Rich, who went on to become one of the first widely published contemporary feminist poets, died Tuesday at her home in Santa Cruz, Calif. She was 82. Rich's work held a special place for many female readers who were looking for poems that related to their lives — and to many female poets looking for signs of encouragement. In the 1950s, when she was in her 20s, Rich had several collections of poems published. In that same decade, she gave birth to three sons and felt constantly torn between her literary ambitions and her family responsibilities. She repeatedly addressed her concerns in her poems and prose. In her book Of Woman Born: Motherhood as Experience and Institution, Rich wrote "we need to understand the power and powerlessness embodied in motherhood in patriarchal culture." After coming out as a lesbian feminist, Rich began to define alternatives to patriarchal values and culture. In 1989, Rich joined Terry Gross for a conversation about her life and work. "I'm very much interested in the place of biography in poetry and in fiction, but I'm also interested in the place of fiction in poetry, and I think that there's a tendency, at present, to read poems as autobiographical statements, documents, narratives — and to miss therefore a great deal that's going on in them. If you ascribe each event to some actual event, if you ascribe each image, each relationship to some literal occasion, it seems to me that you run the risk of missing not only the poetry, but the fuller, richer, deeper aspects of the poems, which come not necessarily from the poet's biography, but from what the poet has seen, heard, drawn into herself or himself from other lives." "I think that it is perhaps that tendency that we have to try to correct the mythologies that we feel have harmed us, the mythologies that deny the strengths and the powers that women have passed onto women, that mothers have passed onto daughters. And these are very real, and we know that they are very real. But at the same time, there are other stories, and I feel as though there needs to be a corrective to the corrective, if you will. We tried in the early years of the feminist movement to look under and behind the myths, the legends that always depicted the stepmother as cruel, the bad mother, the myths in popular psychology of the evil mother, the evil mother-daughter bond. We tried to correct those, and in so doing, I think we unearthed a great deal that was real and important and useful. To idealize, to sentimentalize, to mythologize that — those powers, those strengths, those teachers — takes us into yet another place where I think we are disempowered." "Essentially poetry, if it is poetry, does not lend itself to simple readings, to oversimplifications — though people may try to read it that way. It seems to me that the essential nature of a poem is that there is ambivalence and ambiguity quivering underneath." "I'm one of the lesbians who came out through the women's movement. And I don't mean I wouldn't have come out without a women's movement, but it's very hard to imagine the world without the women's liberation movement at this point. However, in my own history, that was the point. It was a time of tremendous intensity among women — women of all kinds. Women who had known they were lesbians all their lives, women who were then coming out, women who were then and have remained heterosexual. There was a kind of intensity around the politics that was very profound and passionate. It was very moving and very exciting to see women taking their strength and taking hold of each other's strength and bringing out the power in each other. ... The passion was political, and the politics was passionate. Yes, it was very sexual, and it was also a milieu and a time that was very political." "A long-lived relationship is about so many things. It is such a dense and complex process — always a process — and it's not to be summed up. It's not to be turned into some kind of vignette. If we are serious, we also have to recognize that even the longest and richest and densest relationship must end, and we see it around us. We see it in that inevitability of time's power, if you will."